In a statement released this morning by Cambridgeshire Constabulary, police announced that the briefcase abandoned at Great St Mary’s yesterday contained books. Police cordoned off a large area around King’s Parade and evacuated nearby buildings in response to the briefcase, which was taken to be suspicious. 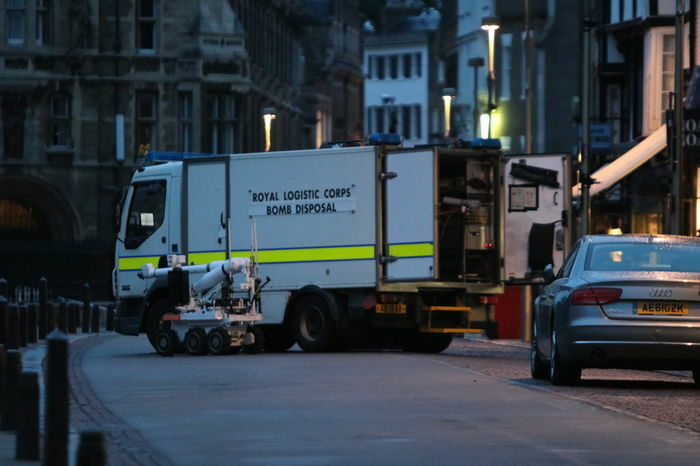 A bomb disposal unit was also called to the scene, and two small explosions were heard at approximately 9.45pm and 9.50pm. The police confirmed this morning that the case was destroyed in the controlled explosions. Diners at the Cambridge Chop House were also evacuated to a safe distance. One customer told Varsity that “a police man came down and demanded that everybody got out the restaurant, so I grabbed my crème brûlée and ran”. Following the arrival of the bomb disposal unit, “onlookers were ushered back, and told to huddle in the alleyway between St Catharine’s and King’s. Students were told to back away from their windows. The van doors shortly opened, and a bomb disposal robot was deployed, moving to a location out of sight near Great St Mary’s. The student telephoned the police after noticing the briefcase was “a bit weird because nobody seemed to be with it”. The University took to Twitter to thank the police for their response to the incident, and also thanked “students and staff who showed such calm and patience”. Gonville & Caius College, who were active on Twitter throughout the incident, also tweeted to congratulate their “students, staff, and Fellows” for their “calm and good humour throughout”. The College was also eager to reassure its followers that “we remained calm during lockdown and did not break into the wine cellar”. The full statement from Cambridgeshire police read: “Police were called at just before 7.15pm yesterday with a report of an abandoned briefcase outside the church in Kings Parade, Cambridge.